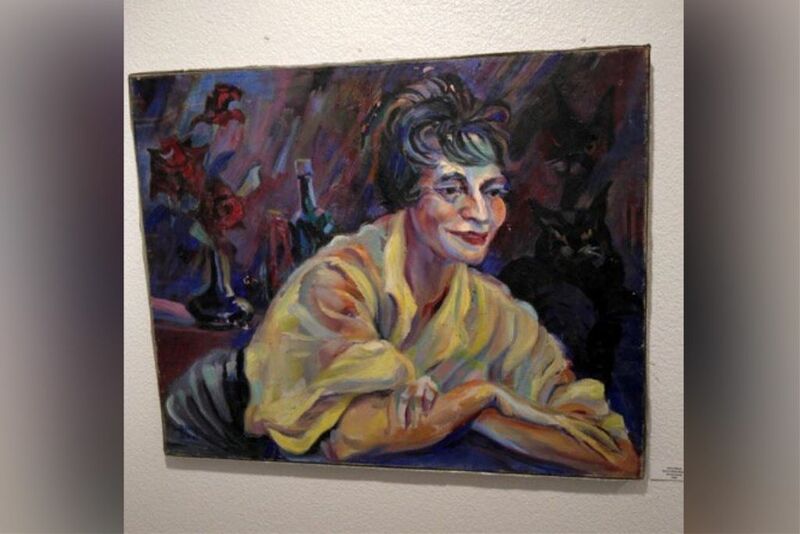 During October, the Art Gallery at Arizona Western College featured oil paintings, mixed media and photographs from the Yuma Fine Arts Association Collection, selected by art faculty and students. 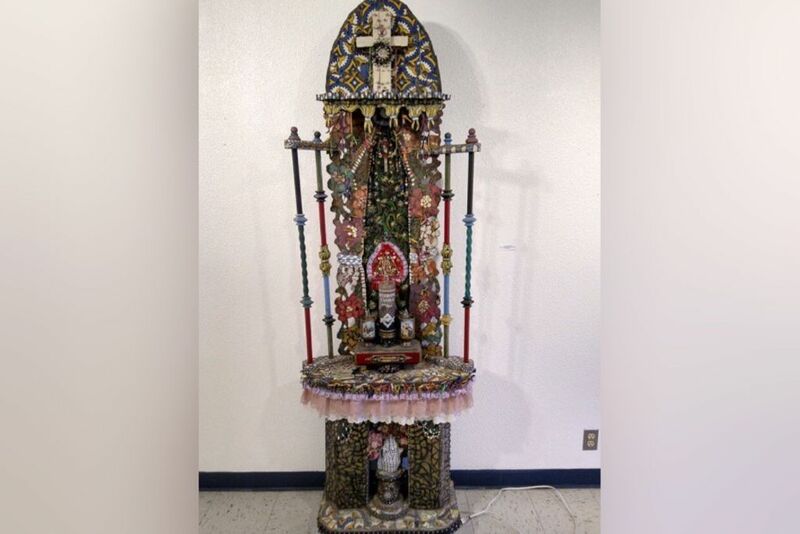 One of the more prominent pieces was House Spirits Gathering of the Past, Suzanne Klotz-Reilly’s sculpture which has so many textures it takes more than one glance to see it all. On its main surface, the altar has three candles reminiscent of the Catholic tradition, framed by brightly painted flowers. At the top sits a white cross surrounded by Mexican tile, and at the bottom is a white mosaic of praying hands tucked between the ornate supporting pillars. Past Waiting, a silver gelatin print by Ken Storch, depicts a wooden mannequin in high contrast against a black background. The mannequin, its legs hanging down over a rock slab, has moss growing on its body, indicating that it has been waiting idly for a long time. Rosemary Hawkey’s I’ve Never Heard of Yuma Africa! is a striking mixed-media piece with a pair of elongated characters, African in their design. 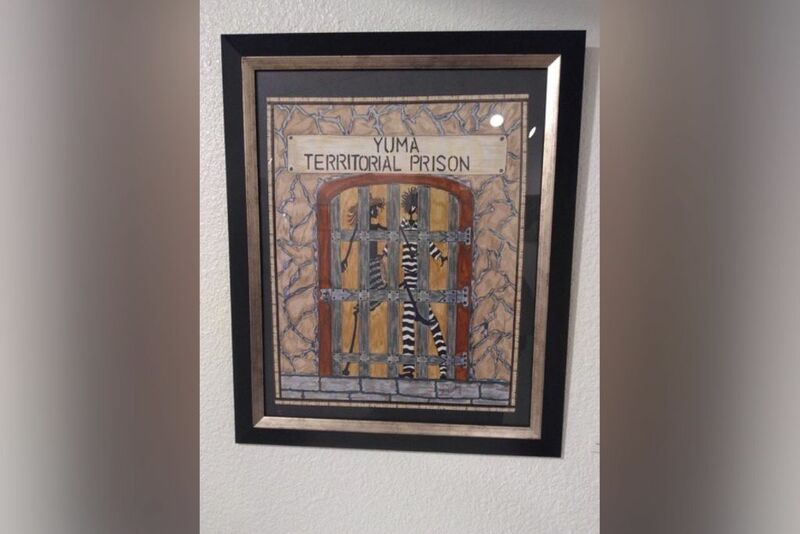 The words “Yuma Territorial Prison” are written above the prison door, and the female figure has a couple of limbs hanging out between the bars, showing a desire for freedom. Harry Wood’s oil painting Girl in Yellow Blouse depicts a seated woman leaning with her arms folded against the armrest on a couch. The blouse’s bright yellow color is intensified by the darker colors in the rest of the painting. In an untitled watercolor by Kate Toussaint, the bright greens create a dreamlike feeling, while shades of purple and blue provide contrast to pull the painted dreamcatchers away from the background. The YFAA began in 1950 with ten local artists. Purchase awards and donations gathered much of the art from the Southwest Invitational art exhibit. The collection includes a mixture of paintings and mixed media to demonstrate the many possibilities of the various mediums.